What an amazing culture of India. In most of the months, there could be some of the festivals which are celebrated mostly by People of India following their rules. This festival days really amazes everyone like say from children to grandparents, all used to enjoy with the flow of it. Similarly, the most exciting there is one named as Ganesh Chaturthi which is celebrated in the month of August or September. This time in 2k16, it is celebrated on 5th September. Yeah! What a unique day to remember as it’s the day when teacher’s day is also celebrated. That’s really cool. Much more excitement is seen in children now. About Lord Ganesha : Ganesha is the son of Mata Parvati and God Shivji. He was the favorite child and Mata Parvati always used to take the side of her little naughty Ganesha who loved the Modak and Laddus always. To steal the Laddus and Modak he took help from his most lovable friend called Mushak ( Mushak ie mouse is the vehicle of Ganpati ). People believe that Ganesha comes on the earth and spread the flowers of happiness and blessings amongst them. People with the full of enthusiasm start decorating their Houses, Offices with flowers or some other ideas of using some theme concept. All the 10 days of Ganpati Chaturthi are rocking and spent with the full of enjoyment following the rituals properly. We the Members of Tecsys Solutions Pvt Ltd are very proud and lucky to have such a friendly boss who used to support us with our ideas and belief of doing something at our office place and grant us the permission for the same. We Team members thought for celebrating this festival in Office so long and after getting the approval from our Manager, we started implementing our ideas. So from the end of August only, we listed each and every thing we will need while doing pooja. Like we all follow the rules of our company, likewise we promised to make Ganpatiji happy with our timely efforts. 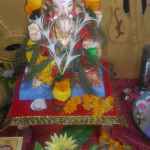 Our belief is that Ganesha will surely visit our office and shower his blessings to all of us and that’s what we need. 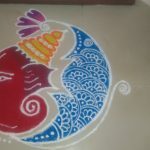 2 days before ie on 3rd and 4th we started with the Ganpati Preparation but after completion of our given task for that day. We don’t like to do anything that affects our work. So we allocated timeslot for the decoration work. We all distributed work so that things will b get done sooner and with mixed ideas of all of our colleagues. 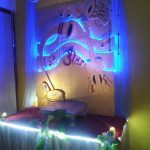 Some team members went to buy other things needed for Arti and others were decorating the room of Ganpati. Girls were involved in making rangoli nearby that room and outside space of our office. 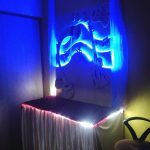 Finally, we completed with the decoration and were waiting for the next day to Welcome Bappa. Yes! 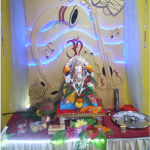 The day arrived 5th September 2k16, and we all were eagerly waiting for lord Ganesha. Around 12:00 in the noon with full of Band Baja instruments and Ganpati songs we started dancing and shouting Ala re Ala Ganpati Ala. Happy to say that, the encouragement and enthusiasm I see in my colleagues while working, the same is seen celebrating all the festivals and making everyone proud in the surrounding. This also brings positivity, confidence, and self-satisfaction amongst us. 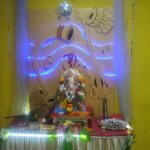 Dis is how We the Tecsys Group welcomed Lord Ganesha and following all the rituals done with the Arti, sung various bhajans. Really that feeling of positiveness can’t be beaten by anything when you listen or sing the songs of Lord and that too with full of strong vision power. At-last, Prasad is distributed amongst everyone.